Between 1934-1938 the Peabody Estate was built alongside Sutton Dwellings with blocks of flats spreading north of Dalgarno Gardens. On Sutton Way, at the far end of the estate, a Community Centre was built to provide activities for the local community. Included was a Nursery School, opened in 1936. After my aunt, Sylvia Ellison, left school in 1925, she went to Whitelands College, then in the King’s Road, Chelsea, for teacher training (Whitelands Court is now on the site of this training College). The College is now in Roehampton alongside Digby Stewart and other Colleges built on land bought from the nuns of the Sacred Heart of St Charles Square of North Kensington. After several jobs and further training at the Rachel McMillan Nursery Training College in Deptford, she came to Dalgarno Way. In February 1935 she received a letter from ‘The Inspector of Infants’ Methods, LCC, about the “new Community Centre in a North Kensington Housing Estate”. She became Superintendent there in January 1936. The Centre was opened by the Viscountess Astor in May 1936. “A State that does not put humanity, and above all, children, before everything, is a blind State” said Lady Astor, MP, on Wednesday, when she formally opened the new Community Centre built by the Kensington Council of Social Service, in Dalgarno Way, North Kensington. Lady Astor was presented with a bouquet of roses by the May Queen, little Ivy Christopher, attended by her maids, Grace Motto, Violet Small, Flossie Powell, Doris Kitchen, Betty Rawlings and Lillian Lee and by her page, Peter Swan. Bertie Bennet, attended by his page, Eric Vince, then presented Lady Astor with a large golden key, and the Centre was formally declared to be open. Though it has, in fact, been operating for about six months. 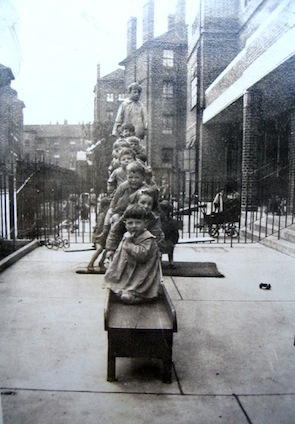 Lady Astor added that she was very pleased to see that the Centre had such a splendid nursery school. Nursery schools could do a great deal towards the improvement of the nation’s health, which at the present time left much to be desired. Finally, she urged all those for whom the Centre had been built to make the fullest use of it and to value it as it deserved. “The whole of the work is, however, severely handicapped by a debt on the building amounting to £1,200, and my committee is exceedingly anxious to clear this off. When this is done we shall be in a position to ask fulfilment of a generous promise of £1,000 from trustees of the City Parochial Foundation”. ………Donations “will be gratefully received and acknowledged”. On 19 January 1937 the Community Centre was visited by the Duke of Kent. “At the community centre in Dalgarno Gardens, North Kensington, the Duke of Kent found 30 babies of between two and three years of age playing in a cheerfully decorated room open to the fresh air and sunshine. The Duke wanted to know how the nursery school was financed, how the children were cared for while their mothers were at work, and whether there was enough accommodation. Miss Sylvia Ellison, principal of the school, told him they had a long waiting list” (The Times, January 20, 1937). Duke of Kent visiting the Nursery School. Interestingly enough, the day the Duke visited the Community Centre, the Evening Standard published the first pictures of the baby daughter of the Duke and Duchess of Kent, who was born on Christmas Day (Evening Standard, Tuesday, January 19, 1937). 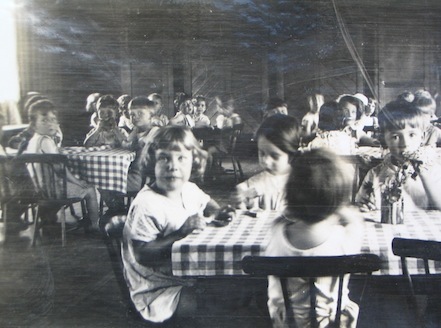 For August Bank Holiday 1938 the children from the Nursery School went to Oakwood, Burwash, Sussex, for the weekend. 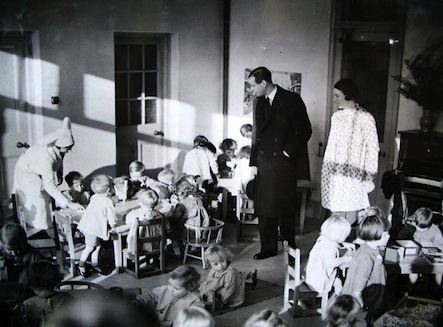 From September 30 to October 4, 1938 (at the time of the Munich Crisis) the Nursery School was evacuated for a short time to Radnage Farm, Buckinghamshire. On September 1,1939 the Nursery School was evacuated again to Penn and on September 15 it moved to Chesham Bois, Amersham. There is a report about this by Sylvia Ellison written in November 1939 (Guild of Friendship, The Friends’ Log, Vol.VII, No 2, 1939). “The house has a large downstairs room with parquet floor in which the children feed and play when they are not out of doors. Upstairs we have three dormitories.There was great excitement for the first few nights when suddenly we heard tremendous bumps and found that various small persons had rolled off the mattresses and were sleeping peacefully on the floor with said mattress on top of them! However, they seem to have flattened out a bit now (mattresses – not children) though why children seem to prefer lying quite uncovered and seem to object to being tucked up, is something that I shall never understand. “I hear that some of you (Guild of Fellowship members) are knitting for us. I need not tell you that warm clothes will be very badly needed in the winter. “You will be amused to know that Brian has been evacuated with the Nursery School and he too is very much enjoying country life. The smells are so much more exciting! He is extraordinarily patient with the children and stands any amount of stroking. His favourite ‘retreat’ is under one of the children’s beds and when I call him there is a quiet patter, patter on the bare floors, and out he comes”. 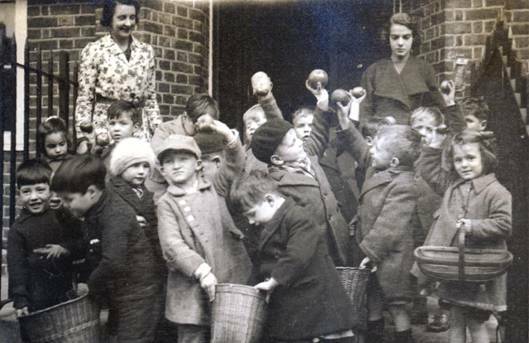 According to Sylvia Ellison’s diary, the Nursery School must have stayed in Chesham Bois, Amersham, from the time it moved there on 15 September 1939. In 1940 the Guild of Friendship, from North Kensington had an ‘outing’ to ‘Miss Ellison’s evacuated nursery school in Chesham Bois’ (The Friends’ Log, 1932-1980). The diary records that there were “bombs in the grounds at Amersham on 14 October 1940”, but nothing further until 31st December 1941 when Sylvia records “Leave Chesham Bois Place and the Nursery School”. No other reference is made to the Nursery School as she goes on to train as a doctor (at the age of 34!) and, when she qualifies in 1948, joins Dr. Wemyss Robinson in her practice at 104 Dalgarno Gardens. Photos from the North Kensington Nursery School scrap book, compiled by Sylvia Ellison are now in the North Kensington Community Archive which is at the Local Studies Centre at RBKC Central Library. This entry was posted in St Quintin Park, Sutton Way, Uncategorized and tagged Community Centre, Dalgarno Gardens, Guild of Friendship, Nursery school, Peabody estate, Sutton Dwellings, Sylvia Ellison. Bookmark the permalink. Hello. I wonder if anyone can remember Slider Road in North Kensington? And the family name Fenner. Thanks so much. Michelle. You say Sylvia Ellison became a doctor in 1948 but, I was the first baby she brought into the world. That was on 25th December 1947. There was no midwife so she must have been a doctor before 1948. She remained my doctor until I moved to Australia in 1967, she frequently commented that I was her first baby.